The XHOSE is an expandable hose made from a rubber inner hose and a foldable, webbed nylon outer hose. As water fills the XHOSE, it expands up to three times its length. When you are finished using it, water drains out and the XHOSE contracts back into a small size. And it is lightweight: a 50-foot XHOSE only weighs about one pound. The XHOSE has a powerful spray and will never kink. Xhose sells in four lengths, which are 25 foot, 50 foot, 75 foot, and 100-foot tube lengths. According to various Xhose reviews from first hand users, the tube sort of expands in length to more than three time its length when not in use. Basically, you will be getting a 75 foot hose length when you purchase a 25 foot tube. This is made possible by the inner hose, which is flexible and expandable especially when using this tube with a water nozzle. The outer hose is meant for protecting the inner tube, and in improving grip. It is a standard model, which does not get slippery when water contacts it and neither is it too rough to hurt our hand. 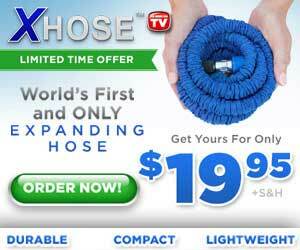 A 25-foot XHOSE – only nine feet long when stored without water – costs $19.95 plus $6.95 shipping and handling. A 50-foot XHOSE – 18.5 feet when stored – costs $39.95 plus $7.95 shipping and handling. A 75-foot XHOSE – 28 feet when stored – costs $49.95 plus $8.95. This is a Combo Kit that includes one 25-foot and one 50-foot XHOSE. A 100-foot XHOSE – 37 feet long when stored – is $59.95 plus $9.95. This is a Combo Kit that includes two 50-foot XHOSEs.